Text by Ellen Hagan. Photos by David Flores. Traveling home to the South is always ripe with longing. Although we live in New York now, Kentucky is home for us, in all its beautiful complications and heartbreak—it calls to us, always. On date night we wanted to experience the radical intersections present in the city of Louisville—to find out where race, class, and landscape intertwine or separate. How do you give love to all directions of a city? Where in the South do people go to nurture and feed one another? We wanted to pay homage to those spots both on and off the grid. Muhammad Ali’s Childhood Home on Grand Avenue in the West End—4pm. Born Cassius Marcellus Clay, Jr., the Louisville great’s home is where we start. Origin story of the West End. Pink painted and pristine. A house that makes us think of family and what it takes to raise greatness. The home museum is closed but we peak inside the windows to see framed family photos then study the Commonwealth of Kentucky plaque out front, where the sign reads: “Education brings self respect.” We photograph ourselves into the frame. Two cups of steaming coffee and peanut butter cookies in what was once dubbed Louisville’s Harlem. Sweet Peaches on Ali Boulevard and 18th Street in Russell is the community coffee shop, home to local organizers and monthly poetry slams. “There's Love in Louisville” scrawled in cursive pastels on the mural outside, this is gathering ground on the west side of the Ninth Street divide. The expressway constructed in the ‘60’s that demolished the African-American business district in the name of urban renewal (or urban removal) slices the city into Black and White neighborhoods, economically rich and poor. But Sweet Peaches is the heart of Russell’s renaissance, holding history and feeding folks. Shawnee Park and Cruising to the Southside—4:45 p.m. The drive to the Olmstead-designed Shawnee Park is a slow crawl along the Ohio River—Great Lawn and Riverwalk Trail—on the mouth of the west side. Segregated from 1924 to 1954—once home to a wealthy White community. Post-World War II the out-migration suburban sprawl began, and the Shawnee neighborhood became predominantly Black. Rich in neighborhood involvement and socially-conscious leadership, Shawnee remains home of family reunions and picnics in the park. It’s a playground full of bundled-up children running from arm to arm. Rush of river breeze—you can feel history here, collect stories and dreams. We drive, stopping to photograph the now-empty Bill Rowland Dry Cleaning and Laundry—how highways like the Shawnee Expressway (264) scar and dissect cities whole. We make photographs of what once was, imagining the homes torn down and land ripped apart. We try to envision what repair looks like here in the West End. Our hunger is insatiable. We head to Vietnam Kitchen on the Southside, taking in the landscape all the way. Mansions to shotgun houses, big boxes to mom and pop shops. We ride past the Americana Cultural Center: “Bridging the gap from surviving to thriving for Louisville’s refugee community.” 5,000 people from 100 countries travel through Kentucky each year searching for place—finding ways to hold on to their culture and blending it with a bit of the Bluegrass. We order Chả giò Vietnam, Xíu Mai and Bò Biá—an assortment of steamed dumplings and rice paper rolls. The coffee comes piping hot and we wait in delight as it drips from the silver pot. 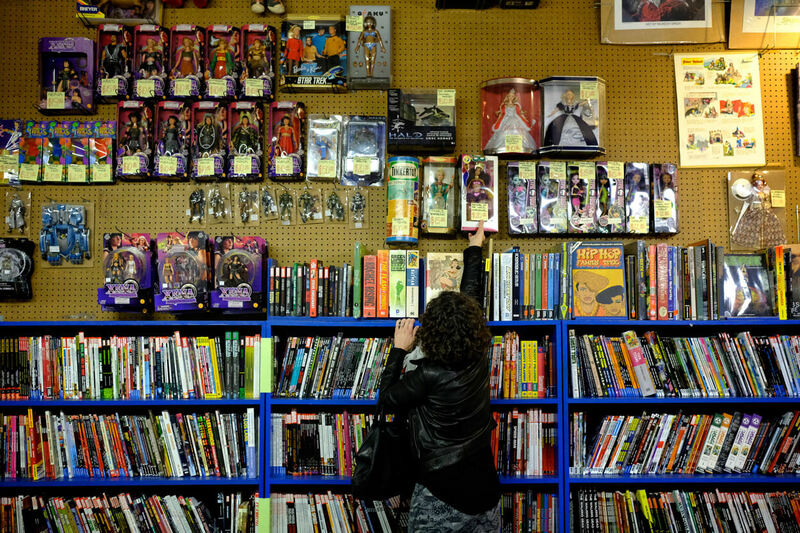 The Great Escape and Carmichael’s Bookstore—7 p.m.
Searching for our comics and lit fix, we head to The Great Escape, the storied Bardstown Road comic book and music shop famous for its 25-cent back-issues day. We cruise the aisles like teenagers, study the wallpaper of Doctor Strange and Green Lantern posters. From Marvel to DC figurines, from Xena the Warrior Princess to Carnaval Barbie of Brazil with her shimmering purple costume and gold crown. And we file through records: Diana Ross, Rolling Stones, REO Speedwagon, Righteous Brothers—each album a reminder of who we were when we first arrived. Carmichael’s Bookstore is up next—the scene of our first date, nearly 12 years ago. Quiet and calm except for the espresso machine whirring in Heine Brothers next door. Local authors celebrated in style—collections of Affrilachian Poets and homages to Southern architecture and mint juleps. Kentucky loves to celebrate its roots. Shirley Mae's Café in Smoketown—8:15 p.m. In a true effort to devour the city, we enter Shirley Mae’s Café on the corner of Clay and Lampton. I’d been reading about Shirley Mae herself, her painstaking preparation of chitterlings and hot water cornbread, and her devotion to home: Smoketown, a historically Black neighborhood since the Civil War. Every year she hosts a salute to Black jockeys from the Kentucky Derby. As a celebration of her café’s 25th year, we hoped to salute her. We slide into the bar for cold Miller Lites, fried jumbo chicken wings, mac and cheese, and green beans with ham hock, sopping up every last bit with her famous cornbread. 21c Gallery and Proof on Main—10:30 p.m.
Home for the night is 21c Museum Hotel. We’re greeted by a Red Penguin, unofficial mascot. The Penguins (90 in total) join us for dinner, round unexpected corners and post up in rooms and galleries—part of an art installation by Cracking Art Group. We travel to the gallery to see “The Future is Female,” with works by Carrie Mae Weems and Frances Goodman. Pose in front of Astrid Krogh’s “Meadow,” made of optic fibers, light monitors and aluminum. So much of the night was spent in awe, staring lovingly at the landscape, honoring Louisville’s past, and kissing in Shawnee Park or in the gallery of 21c. As a mixed-race couple representing the Philippines, Assyria, Ireland, Italy, and Scotland, our South is multicultural. We are all the time looking to find ways to be in dialogue with the Bluegrass—with home. As artists, we are seeking what’s equitable, what traditions need to be in conversation, what food needs to be devoured and what art needs to be celebrated. Intersections set the city anew. Ellen Hagan is a writer, performer, and educator. Her latest collection of poetry Hemisphere, was published by Northwestern University Press, Spring 2015. Ellen's poems and essays can be found in the pages of Creative Nonfiction, Underwired Magazine, and She Walks in Beauty (edited by Caroline Kennedy). Her first collection of poetry, Crowned, was published by Sawyer House Press in 2010. Member of the Affrilachian poets, Ellen lives in New York City with her husband and daughters. A woman was charged almost $200 to divorce her abusive husband. She and her lawyer asked the Kentucky Legislature to fix it.